The divisions among House Republicans over how deeply to cut federal spending reflect fundamental differences within the GOP base. Roughly half of Republicans and Republican-leaners agree with the Tea Party movement, and they take a much harder line on cutting federal spending than do Republicans who disagree with the Tea Party or have no opinion of the movement. 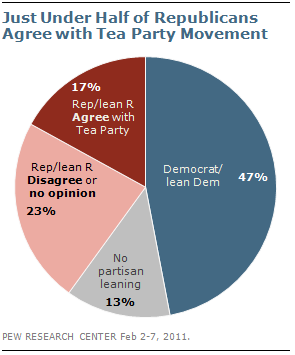 In fact, across a wide range of issues — including federal spending on entitlements, education, agriculture and energy — the spending preferences of Republicans and GOP leaners who do not agree with the Tea Party are far more in sync with Democrats than with Republican supporters of the Tea Party. 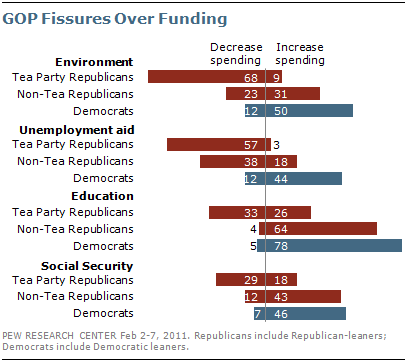 In each of these areas, both Democrats and non-Tea Party Republicans would rather see spending increased than decreased; by contrast, Tea Party Republicans favor spending cuts over spending increases. Republican intra-party divisions are particularly sharp over funding for education, Social Security and environmental protection. A third (33%) of Republicans and GOP leaners who agree with the Tea Party favor decreasing federal education spending, compared with just 4% of non-Tea Party Republicans. Instead, 64% of non-Tea Party Republicans want increased education spending, as do 78% of Democrats and Democratic leaners. GOP divisions are at least as wide on specific education spending lines; Tea Party Republicans favor decreasing spending on college loans and K-12 public schools by roughly two-to-one, yet non-Tea Party Republicans want to see such spending increased by at least as wide a margin. Social Security and Medicare also divide the Republican base. On both issues, at least a quarter of Tea Party Republicans are prepared to make cuts, while non-Tea Party Republicans side with Democrats in favoring increases over decreases. And while 68% of Tea Party Republicans favor cuts in funding for environmental protection, just 23% of non-Tea Party Republicans agree (and 31% want to increase spending). These intra-party divisions do not span all issues. For example, about half of both Tea Party and non-Tea Party Republicans favor increased spending for veterans’ benefits and services (as do about half of Democrats and Democratic-leaners). Majorities of Republicans and Republican leaners, regardless of whether they agree with the Tea Party, favor reductions in foreign aid spending, though there is more support for this among Tea Party supporters (75% vs. 56% of non-Tea Party Republicans). Among Democrats and Democratic leaners, as many support increasing (29%) as decreasing (28%) aid to the world’s needy. Similarly, both Tea Party and non-Tea Party Republicans tend to favor decreasing federal assistance to the unemployed, though again, this is the majority view (57%) among Tea Partiers, compared with 38% of non-Tea Party Republicans. Just under half of Republicans and Republican-leaning independents say they agree with the Tea Party — representing 17% of Americans overall. The remaining Republicans make up 23% of the public, and either disagree with (3%) or have no opinion of the Tea Party (20%). Republican opinions of the Tea Party have been relatively stable over the course of the past year, though support may have slipped slightly since the election. In the Pew Research Center’s survey conducted the week after GOP victories in November, 51% of Republicans and Republican leaners said they agreed with the Tea Party. Today, this figure stands at 43%, while 57% either disagree or have no opinion. For more on public opinon and the budget see, “Fewer Want Spending to Grow, But Most Cuts Remain Unpopular” at people-press.org.